The cerebellum is increasingly recognized to be involved in limbic and cognitive-associative functioning. Cerebellar cognitive affective syndromes may result from various types of injuries. Cerebellar mutism may occur in children after resection of midline tumors in the posterior fossa, which has been thought to be related to damage to the cerebellar vermis. Here, we investigated whether bilateral lesions of the fastigial nucleus, which is located within the upper vermis, would affect social behavior in a rat model. Juvenile male Sprague–Dawley rats, aged 23 days, underwent bilateral thermocoagulation of the fastigial nucleus via stereotaxically implanted electrodes under general anesthesia. Electrodes were inserted without application of electric current in a sham-lesion group and naïve rats served as additional controls. All groups underwent standardized examination before surgery and on specific time points up to 49 days after surgery to investigate locomotor activity, motor coordination, social behavior, and ultrasound vocalizations during social interaction. Finally, lesions were verified histologically. Playing behavior and vocalizations were reduced up to 4 weeks after surgery in rats of the lesion group compared to rats with sham-lesions and controls. After surgery in rats of the lesion group, locomotor activity was disturbed for 3 days as compared to sham-lesion rats, but for 4 weeks as compared to controls. Motor coordination measured by the rotarod and balance beam test was compromised until adulthood. 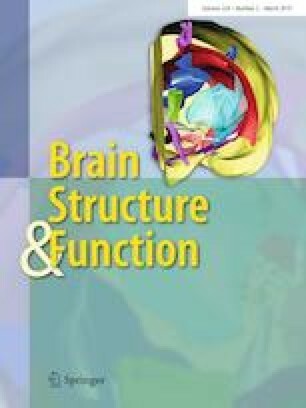 Bilateral lesions of the fastigial nucleus in juvenile rats cause a severe and long-lasting reduction of social interaction and motor coordination in juvenile rats, which has some similarities to cerebellar cognitive affective syndromes in the human context. This indicates a modulating role of the fastigial nucleus with regard to neural circuitries relevant for social behavior, such as the limbic system and the prefrontal cortex.